When I was in college I took a class called Anthropology of Religion, which was taught by a professor who also happened to be an Episcopal priest. At the time I was a fairly rigid evangelical whose opinion about the Bible was that if anything in it was wrong, then the whole thing could be wrong, and therefore the Bible had to be totally right. 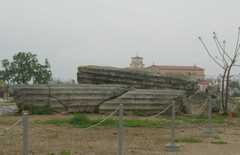 Photo: Fallen columns at Corinth with modern church in background. The class fascinated and challenged me on many levels, and when I found out the professor was a Christian I visited his office and asked him what he believed about Christianity and truth. "I am a sacramentalist," he said. "I believe that God has put everything into the world that is necessary for it, and God does not need to intervene personally." That rocked my world. I can't remember whether he said that the Resurrection happened, but it didn't seem to be such a big deal to him if it didn't. Robert Capon, another Episcopal priest, has written that Christians need to live in this world that seems completely random as if it were totally full of grace. Though it seems that we are just a dust-mote in the sunbeam of the universe, we should live like we are God's children basking in God's favor. There's a subtle difference between Capon's idea and the oft-repeated "Everything happens for a reason." For a long time, I looked for hidden clues in everyday life-- signs that pointed to some outcome, trends towards a bigger picture, events harmonizing with an underlying, unseen plan. I figured if I looked for God's hand in the world, I would see it. I was hoping to see that everything happens for a reason. But I ended up frustrated, because my world lacked grace. Instead of looking at the goodness of the world, myself, and other people (and thereby the goodness of God who made all this), I was looking at imaginary structures and patterns, which were of my own creation. I was bound to be disappointed at a world that didn't-- and wouldn't-- conform to my preconceived notions. On my visit to Greece in 2005 I sought out an icon painter: a woman who had learned the ancient, traditional art of painting (the technical term is "writing") religious portraits and scenes on wood, for mounting in private houses and in churches. My friend Todd has a blog with many images of the icons of saints, and I'd promised him an original. At the time the artist had only one original available for sale: a representation of Elijah the prophet, being fed by a raven in the wilderness during a God-imposed famine on the land. It was a handsome thing, and I wanted it for myself, but I also wanted to give Todd his gift. So I bought that one and ordered another, one of St. John Chrysostom, patron of preachers and teachers. The artist lovingly wrapped the icon and I took it back in my carry-on luggage. Todd was impressed with his gift, and that was the last I've heard of it. I mean, the last of it I've heard from him in person. Later, Todd wrote in his blog about the icon, digitally wondering why I gave it to him. Now he could've just called me, but he was inspired to say that the icon spoke to the theological struggles our denomination is undergoing and his (and his wife's) feeling of being in a desert or wilderness because of those struggles. I've never told him that the reason was simply that that was the only one. Yet he has made meaning come from the icon, as I knew he would. That is a glimpse into how I see life nowadays. We do not know why God gives us what he gives, but we make meaning out of it and live in gratitude. Now I could not stand to be the type of person who always has a smile on his face and says stuff like, "God has been sooooooo good to me. My house just burned down, but I am giving thanks for one doozie of a neighborhood marshmallow roast." Grouching at God is one of my hobbies. It's just not my job. I, too, aspire to be a sacramentalist, though not necessarily the same kind as my professor. For me, a sacramentalist is a person who sees creation as good-- as sacred, in fact, just by God's creation of it. I am sure God intervenes personally in the world, but that is not my focus. The important thing is that whatever does happen, whether it seems random, or by a plan, it is (as them young'uns say now) "all good." What prompted these theological musings? I got a fortune cookie message last week that said, "You are transforming yourself into a person who is sure to succeed." A few years ago I would have taken that as a message from God that my manuscript was about to be accepted and a best seller would be soon to follow. It would take my mind off of present sadness and I would actually work less hard on my writing, waiting for that word to come. This time I just gave thanks for fortune cookies messages, which I love, and looked forward to my writing summer. If I have any success in publishing, I'll post about it. In the meantime, in this world full of seemingly random suffering, sadness, and doubt, I wish all of my readers a summer full of seemingly random beauty, love, and everything else that makes their hearts sing. And whatever happens, I wish you sweet spirits. I think one of the ways we are "made in His image" is that we habitually make everything from nothing. In our case we are making meaning where there might not be any except to us, and we seem to make all of our individual meaning (our everything) from the "nothing in particular" around us. In His case He literally made EVERYTHING out of nothing at all. And both are valid activities, I think (I hope). And all the meaning is real, even if most of it can't be deciphered (it's just fragment). Much of it isn't intended to be understood; we don't profit from trying too hard to read all the events in our lives. We're supposed to read them in our peripheral vision, not look at them too closely. But some things plainly are intended to have meaning, and we CAN look closely. We're repaid handsomely for doing so. Some of these events are written in God's meaning - like the Creation, the Incarnation, the Resurrection, and they are too BIG for us to understand, but we profit from trying. Others are written in our meaning, like artwork, our love for each other, our spoken words. God is in all of these meanings, too, but it seems to me this is Him letting us play and work alongside Him, letting us be in His image every day. And then there are the events that are written by us both together - like the Eucharist, or children. I love them all, but it's this last group that stops me, and makes me follow the words from the prophet, "Be still and know that I am God." Oh yes, He is. He is that IS, and we're right up there beside Him with our hands in the same clay, making things together and being made all at once. May our hands all come to be within His, and may we all rejoice in it. Thanks for that eloquent extension of the post, MoomPa. What you said about art made me think that making meaning from literature is in the same category. I also believe that we are repaid handsomely by paying attention to the meaning that comes from stories and poems and other written art. And by the way, I hope to resume Healing Knowledge this summer. The end of the school year sort of put an end to all coherent creative thought. I definitely agree about literature. I used to mean art as painting, drawing, etc. - and that's still my own primary outlet. But for years now when I think of the arts I generally think of the whole family: drama, literature, music (performing and composing), the plastic arts (painting, sculpture, drawing), architecture (including landscape architecture), dance (performing and choreographing)... and I meant all of them when I referred to art above. And many more layers of meaning are possible in some of the artistic ventures that combine tow or more of the arts - as opera does, or the cinema. I figured the end of the school year was what temporarily shut off the work on Healing Knowledge. I'm looking forward to Chapter 10. I wish you good writing.